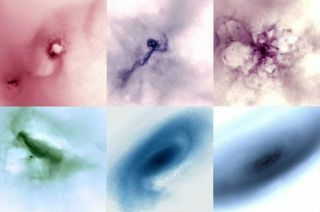 These images depict various stages of galaxy formation under the cold dark matter theory using new computer simulations that account for the effects of supernova explosions. Ithas long been a mystery why small galaxies don?t have as many stars and matterin their centers as predicted. Now scientists have found the answer with a newsimulation of galaxy and star formation. Allgalaxies are thought to form inside large cradles of invisible stuff calleddark matter. Scientists can't measure dark matter directly, but they suspectit's there because of its telltale gravitational tug on regular matter. Andminiature galaxies called dwarf galaxies seem to have even higherproportions of dark matter than regular galaxies. Theso-called cold dark matter theory does very well at explaining how most largestructures in our universe form. But it cannot describe dwarf galaxies that well:It predicts that they should have more mass, including both normal and darkmatter, in their cores than they do. Butthe new supercomputer model includes both cold dark matter theory, as well as detailedtheories of star formation, scientists say. "Mostprevious work included only a simple description of how and where stars formedwithin galaxies, or neglected star formation altogether," said FabioGovernato, an astronomer at the University of Washington. "Instead weperformed new computer simulations, run over several national supercomputingfacilities, and included a better description of where and how star formationhappens in galaxies." Themodel accurately predicts some of the types of dwarf galaxies that we see around us in theuniverse. Governato and colleagues report their results in the Jan. 14 issue ofthe journal Nature. Akey to the new model is that it includes a phenomenon known as stellar wind.When very large stars die, they explode in big blasts called supernova thatcreate huge winds that sweep gas away. When enough gas is pushed out of thecenter of galaxies, the gravitational pull there is diminished and dark matter,as well as normal matter, just drifts away. Sincedwarf galaxies are so small to begin with ? they typically have around one-tenth,or less, of the mass of the Milky Way ? they have a harder time holding on totheir mass than larger galaxies. Whenthis piece of the puzzle was included in the simulations, the empty-centeredgalaxies finally made sense. "Thecold dark matter theory works amazingly well at telling where, when and howmany galaxies should form," Governato said. "What we did was find abetter description of processes that we know happen in the real universe,resulting in more accurate simulations." Theresearchers used their model to simulate the formation of two dwarf galaxies.While these results are impressive, they must be shown to hold true for a widerrange of galaxy masses and environments, said Marla Geha, an astronomer at YaleUniversity who did not work on the project. oftheir simulated galaxies are nearly indistinguishable from the realthing," she wrote in an accompanying essay in the same issue of thejournal Nature.